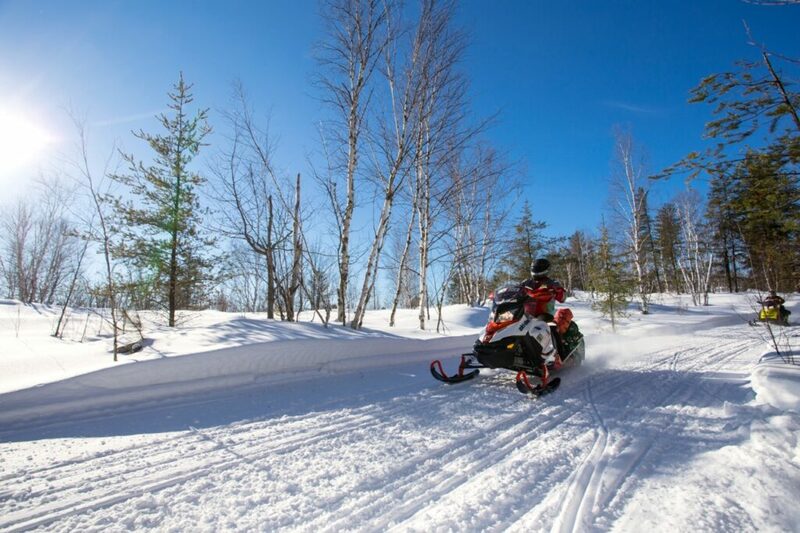 Start your ride planning with this Sudbury snowmobiling snapshot. 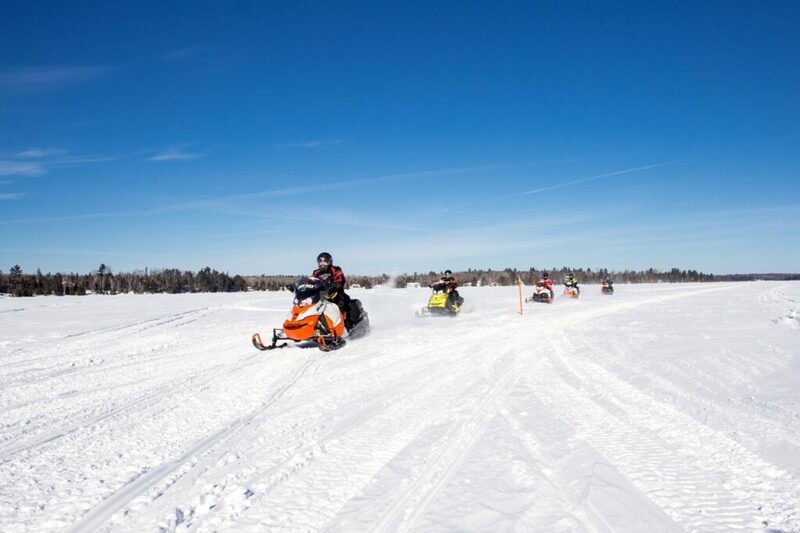 It will help visiting snowmobilers find a memorable, long weekend sledding getaway of day loops in the area. Or discover an outstanding staging gateway for saddlebag rides to other destinations in Northeastern Ontario. Located in OFSC District 12, Sudbury (pop. 160,000+) is Ontario’s largest urban centre north of the Greater Toronto Area (GTA). It offers big city services, amenities, shopping, nightlife and attractions to more than fill any non-sledding hours and desires. It’s also home to the Sudbury Trail Plan. 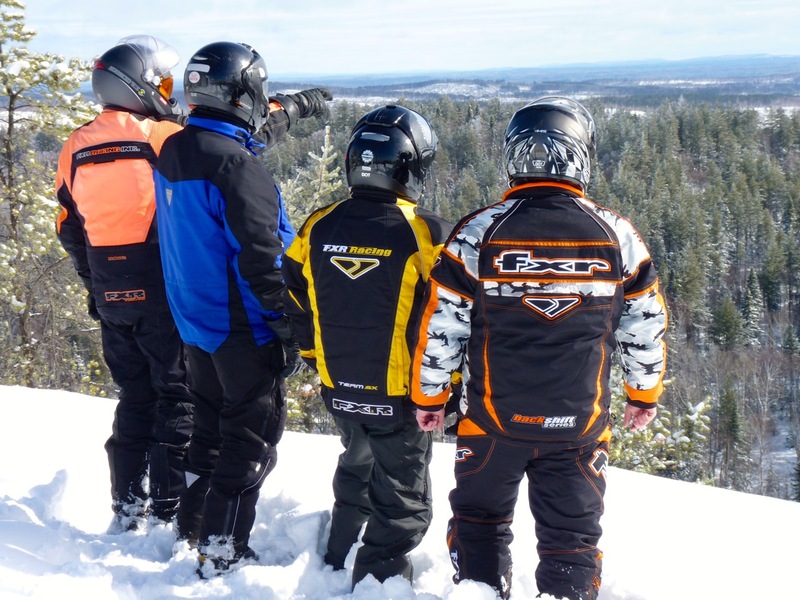 This association of area snowmobile clubs is a pioneer of cooperative and coordinated regional grooming. It now operates for all District 12 clubs. 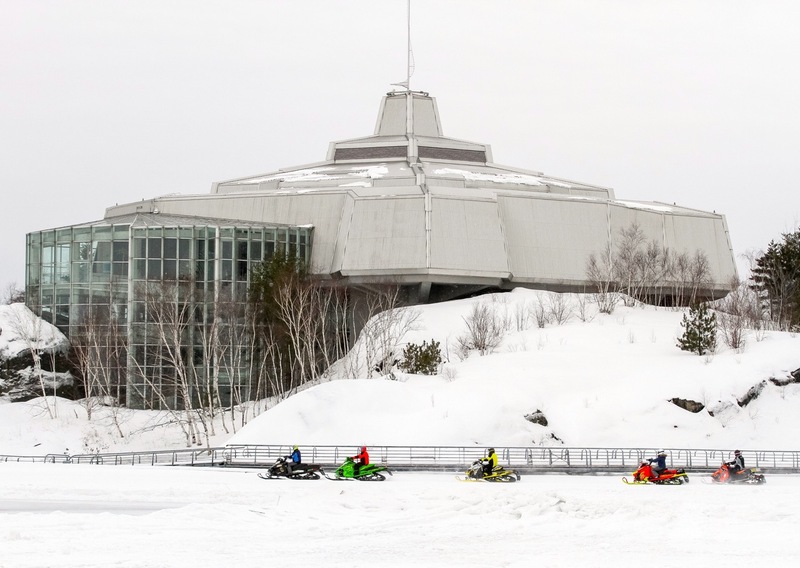 Together, these two attributes make Sudbury an ideal snowmobiling hub. 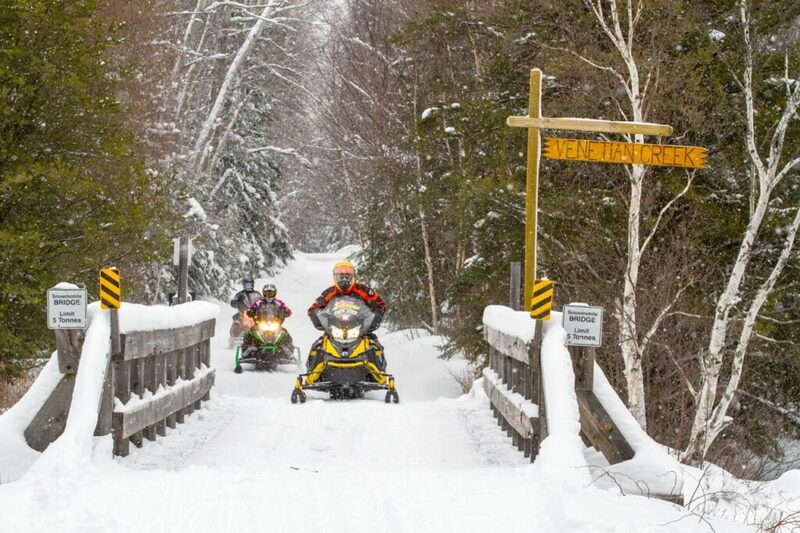 And also a premier staging location for snowmobilers heading off to explore OFSC trails throughout Northeastern Ontario. What’s more, with access via the mostly four lane Highways 400 & 69, the 390-kilometre drive to Sudbury from the Greater Toronto Area and other points south is a breeze. 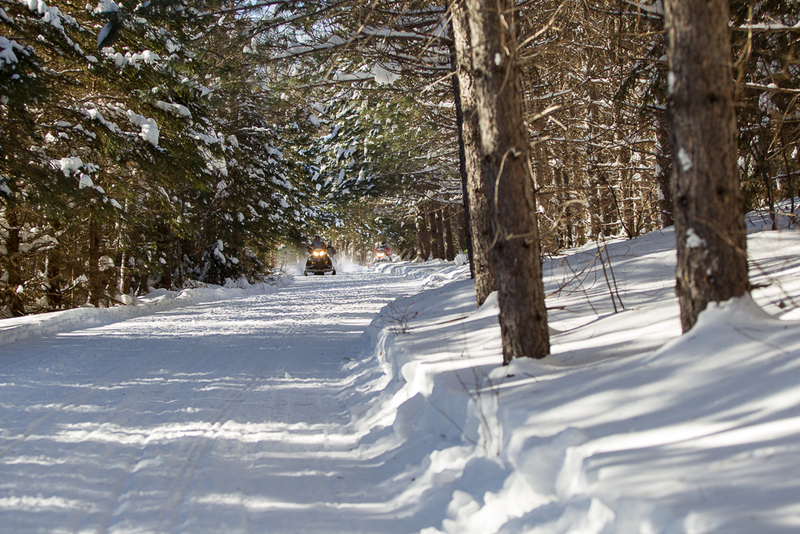 The original 8 clubs of the Sudbury Trail Plan operate over 1,000 kilometres of groomed trails all around the City of Sudbury. The overall quantity and quality of trail signage throughout this trail system is very good. Plus, the grooming is consistent and reliable. It’s not surprising with a city of this size that trail routing and access is mostly around the periphery. So it follows that the snowmobile-friendly accommodations with trail access are in the “suburbs” so to speak. My favourite is the Moonlight Inn & Suites at the east end of town, on the south side of Highway 17 on TOP Trail D111. Sudbury offers snowmobilers peace of mind with a full compliment of snowmobiler dealers for sleds, parts, service and gear. Sudbury Boat & Canoe (Arctic Cat). 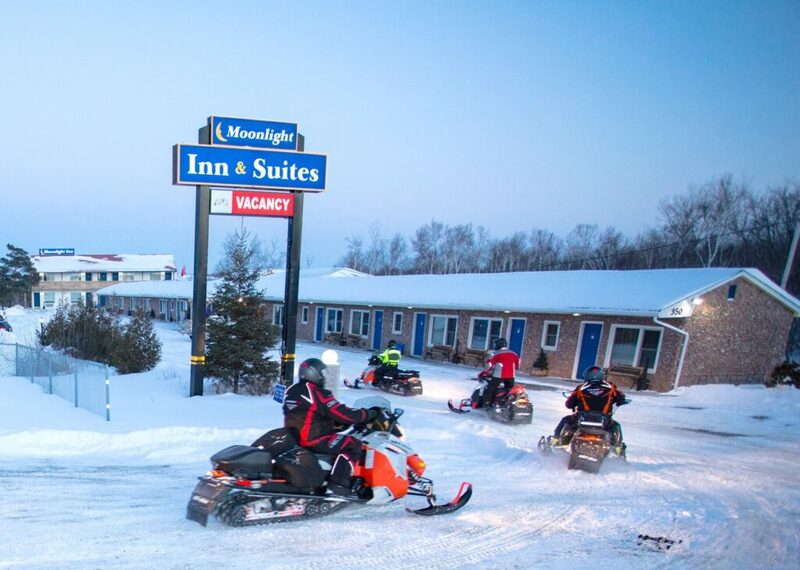 From Sudbury, riders can ride several different day loops, while staying from the Moonlight In & Suites each night with no need to carry saddlebags. These include four OFSC-Promoted Snow Tours. To the north of town, snowmobilers can ride the Cartier Moose Loop or Chiniguchi Wolf Loop. Meanwhile to the south, the Rainbow Elk Loop and Deer Loop provide even more riding adventures. For those planning a loop ride, remember to add kilometres to the loop distances indicated below. This is to account for getting to and from any lodging not actually located on the loop. At 210 kilometres around, the Chiniguchi Wolf Loop is positioned northeast of Sudbury. Essentially, its TOP Trails circle the largest area water body, Wanapitei Lake. They are also adjacent to the Wolf Lake Forest Reserve, the world’s largest old growth red pine forest. One highlight of the Chiniguchi Wolf Loop is the scenic lookout at the top of Wolf Lake Mountain. It’s accessed by Local Trail 76. At 503 metres, it’s the region’s highest trail accessible elevation. There is one popular location on route for fuel and food. Although Rockys is a slight detour off the loop route, it’s well worth the visit. The west side of this loop passes by towns like Capreol and Hanmer where more services are available. Note that there are no services on north section of this loop. And that fuel, but not food is available at the Sportsman’s Lodge on Lake Kukagami (except for overnight guests). The 225-kilometre Cartier Moose Loop is located northwest of Sudbury. It shares some sections of its east side trails with the Chiniguchi Wolf Loop. That’s why in some places, you’ll spot signs for both tours on the same post. Services are available here. It’s easy to make good time on this loop’s TOP Trails as they follow old logging roads through the Laurentian Highlands. Be sure to stop at the picturesque Onaping Bridge. On this loop’s west side, there’s gas in Cartier. But Windy Lake Lodge provides the only stop for fuel, food and lodgings. The Deer Loop is accessed west of Sudbury, between Lively and Espanola. 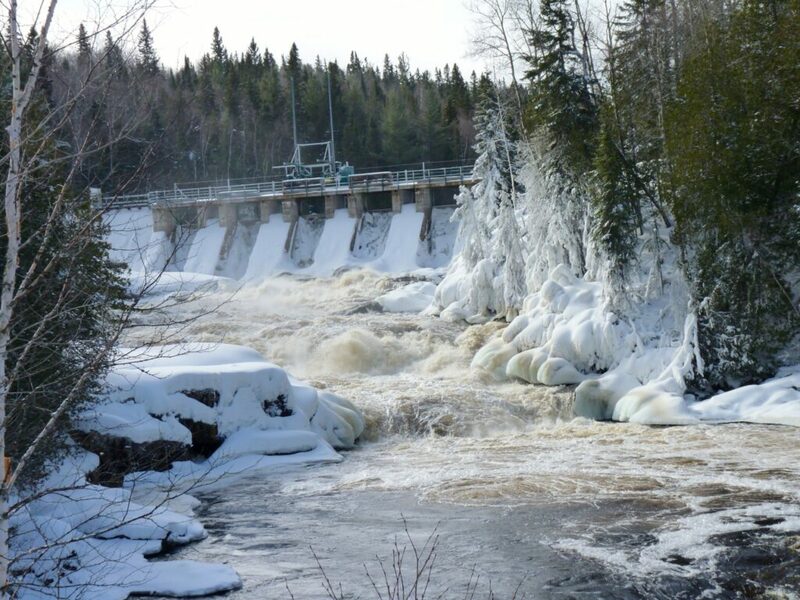 Much of it runs through the picturesque LaCloche Mountains. With a distance of 175 km, some of it lake running, it’s an easy day ride through great Canadian Shield scenery. Services are available at Nairn (Esso + Jeremy’s Country Kitchen), Espanola (lodgings too) and Penage Bay Marina. This snow tour is the longest of the three loops. At 252 kilometres, it extends southwest from Sudbury all the way to Killarney. Unlike the Cartier and Chiniguchi Loops, the Rainbow Elk Loop also involves some lake running, albeit on clearly marked and staked trails. Scenic points of interest include Sherwood Forest. Food, fuel and lodgings are available in Killarney at the Sportsman’s Inn.